Platforms Optional: The Fbook Quarterly F*ck Up Is Here! I was just thinking it had been awhile since Facebook screwed up a Big Site Improvement launch. Well, wait no more! The custom username URLs are coming! Your new Facebook URL is like your personal destination, or home, on the Web. People can enter a Facebook username as a search term on Facebook or a popular search engine like Google, for example, which will make it much easier for people to find friends with common names. Think carefully about the username you choose. Once it's been selected, you won't be able to change or transfer it. So let's assume I'm not the first of the 80 Stephen Strongs on Fbook to reserve our name. What do I get next: stephenstrong276? or maybe theotherstephenstrong? 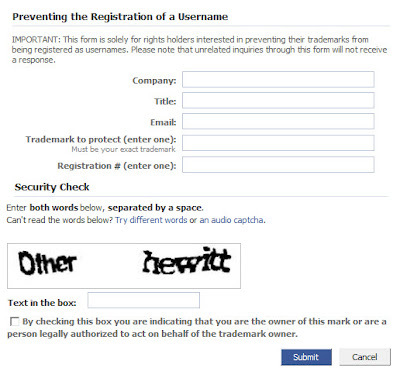 Not since the bygone days of AOL username picking has my self-identification stress level been sooo high. But wait a second, why do I need a custom URL? Don't my friends already know how to find me? Shouldn't anyone wanting to be my "friend" get connected via one of my linked-friend's pages? Fbook has been successful because it is a closed-loop network. Not the freewheeling "everyone be my friend" chaos that doomed MySpace. Hmmm. Not even sure if I should care. At least not about my personal URL. But I represent over 10 brands for my company online. None of which have an Fbook fan page now. Some might justify it in the near future. Some won't. But I definitely don't want a cybersquatter claiming the names for their URL. C'mon Fbook! I know you're thinking about all the potential advertising revenue and a way to protect the 95% of brands who aren't on you yet. But seriously, did they really have to announce this spontaneously only 4 days in advance? Can someone over there apply some common sense to these launches? They obviously haven't learned a damn thing from all their other Big Site Improvements. Most of which did not go over so well. It's one thing to annoy and disappoint your average user. But marketers (the ones who could actually contribute to a revenue stream) don't have the patience for this type of thing. We're needy, pouty, and always expect to get our way when we bring the checkbook. I'd hate to be the media sales rep trying to sell Big Industry on establishing an Fbook presence next month. Especially as he tries to explain why theothercompanythatsellsfriedchicken isn't such a bad URL to have. Much better than theothercompanythatsellsfriedchicken276. Let the Backlash Countdown begin!